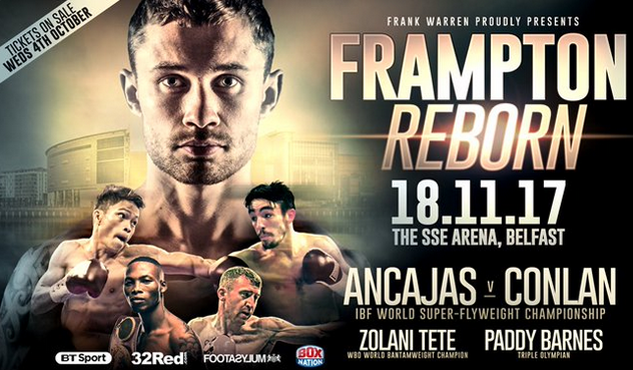 Filipino IBF World Super Flyweight champion Jerwin Ancajas will defend his title against the undefeated boxer from United Kingdom Jamie Conlan on November 18th at The SSE Arena, Belfast, UK. Ancajas will try to defend his title for the 3rd time after being able to hand it against McJoe Arroyo of Puerto Rico last year. The Fighter from Cavite City, Cavite, Philippines is currently has a record of 27W(18KO)-1L-1D. The IBF World Super Flyweight champion defended his title against Jose Alfredo Rodriguez last January and Teiru Kinoshita last July both by stoppages. On the other hand, Jamie Conlan is also an undefeated boxer with a record of 19W(11KO)-0L. Conlan never fought any fighter like Ancajas before but the brawler Brit has something and can upset the fight. Conlan defeated Yader Cardoza in his last fight via Split decision to win the vacant WBC International Silver Super Flyweight Title.